Montagnana, M., Danese, E., Lima-Oliveira, G., Salvagno, G., Lippi, G. (2017). Dark Chocolate Intake Acutely Enhances Neutrophil Count in Peripheral Venous Blood. Iranian Journal of Pathology, 12(3), 311-312. Martina Montagnana; Elisa Danese; Gabriel Lima-Oliveira; Gian Luca Salvagno; Giuseppe Lippi. "Dark Chocolate Intake Acutely Enhances Neutrophil Count in Peripheral Venous Blood". 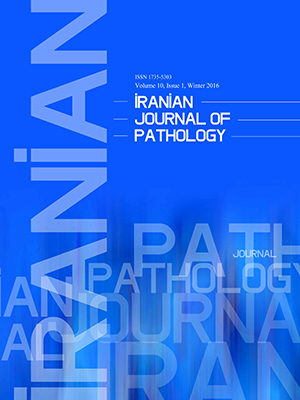 Iranian Journal of Pathology, 12, 3, 2017, 311-312. Montagnana, M., Danese, E., Lima-Oliveira, G., Salvagno, G., Lippi, G. (2017). 'Dark Chocolate Intake Acutely Enhances Neutrophil Count in Peripheral Venous Blood', Iranian Journal of Pathology, 12(3), pp. 311-312. Montagnana, M., Danese, E., Lima-Oliveira, G., Salvagno, G., Lippi, G. Dark Chocolate Intake Acutely Enhances Neutrophil Count in Peripheral Venous Blood. Iranian Journal of Pathology, 2017; 12(3): 311-312. Beside the well-established impact on decreasing the risk of cardiovascular diseases (1), recent attention has been paid to the relationship between cocoa-containing foods and the immune system (2), showing that dark chocolate consumption enhances the systemic defense against bacterial (3) and viral (4) infections. Hence, the current study aimed at investigating the acute effect of dark chocolate intake on peripheral blood leukocytes. Lippi G, Franchini M, Montagnana M, Favaloro EJ, Guidi GC, Targher G. Dark chocolate: consumption for pleasure or therapy? J Thromb Thrombolysis 2009; 28:482-8. Pérez-Cano FJ, Massot-Cladera M, Franch A, Castellote C, Castell M. The effects of cocoa on the immune system. Front Pharmacol 2013;4:71. Niehues M, Stark T, Keller D, Hofmann T, Hensel A. Antiadhesion as a functional concept for prevention of pathogens: N-Phenylpropenoyl-L-amino acid amides as inhibitors of the Helicobacter pylori BabA outer membrane protein. Mol Nutr Food Res 2011;55:1104-17. Kamei M, Nishimura H, Takahashi T, Takahashi N, Inokuchi K, Mato T, Takahashi K. Anti-influenza virus effects of cocoa. J Sci Food Agric 2016;96:1150-8. Simundic AM, Cornes M, Grankvist K, Lippi G, Nybo M. Standardization of collection requirements for fasting samples: for the Working Group on Preanalytical Phase (WG-PA) of the European Federation of Clinical Chemistry and Laboratory Medicine (EFLM). Clin Chim Acta 2014;432:33-7. Ellinger S, Stehle P. Impact of Cocoa Consumption on Inflammation Processes-A Critical Review of Randomized Controlled Trials. Nutrients 2016;8(6). pii: E321.